Why doesn’t Hollywood ever just quit while they are ahead? It seems that no matter how many times critics have sounded the alarm, studios keep pushing the envelope, essentially bleeding whatever creativity left out of a particular narrative at the expense of creating an entertaining product. Why should it even matter any to a studio if fans will flock to any release just because it is associated with a particular cinematic universe? According to Imdb.com, The Conjuring and The Conjuring 2 brought in a combined $618 million worldwide in ticket sales. The difference between those movies and The Nun is how engrossing their narratives are. ‘The Conjuring’ follows the exploits of Ed and Lorianne Warren as they investigate the paranormal. Patrick Wilson and Vera Farmiga are stellar, and director James Wan seamlessly weaves in those elements of horror. The Nun is a drastic departure from what has worked. Director Corin Hardy’s initial foray into The Conjuring cinematic universe relies upon the alleged popularity of an element of terror found in the first two films. Neither of those first two films is built around The Nun, she’s just an element of horror which others have to contend with. What made Wan’s creation interesting wasn’t who this paranormal beast was but how her presence affected others. Had The Nun actually been an origin story, it would have made the many issues plaguing the film palatable. Instead, we are left to follow a priest with a past and a novitiate (who is on the verge of taking her vows) as they travel to Romania to investigate news of a nun who committed suicide. Wan and Gary Dauberman’s narrative doesn’t lay any groundwork as to the origin of the demon or why it’s even locked in catacombs under the convent. A difficult decision to be sure. At no point does it make sense to include the Novitiate on this journey either. 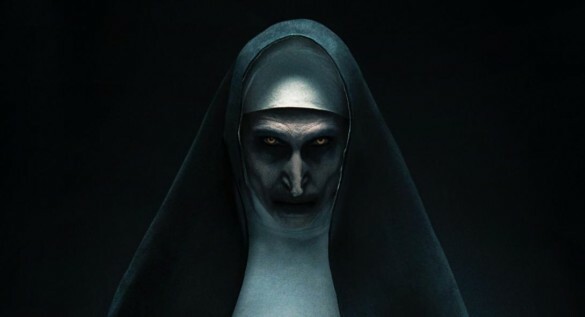 Initially, it appeared as if she was to become this hideous beast knows as The Nun, but that’s disproven towards the last 20 minutes of the film. So we are left with a meandering tale which goes from one predictable jump scare to the next. Visually, The Nun is far from appealing. For starters, the abbey was constructed by the least inspired architects in Romania (that’s the only justification for the church’s dull appearance). The use of lighting is meant to heighten the tension of the film but in reality becomes a distraction as it’s hard to see most of The Nun. Maybe they were doing us a favor? Demián Bichir portrays Father Burke (the priest sent from the Vatican to investigate what’s occurring in Romania), and his performance was pedestrian at best. However, if Oscars were given just for facial expression on camera, then Bichir would easily be the front-runner. Taissa Farmiga’s portrayal of Sister Irene was lackluster which is why no one cared about her plight. If The Nun is going to sidestep the apparent need for a true origin story for this narrative then at least frame the story so the audience will give a damn whether or not Sister Irene dies! Overall, The Nun is an uninspired poorly constructed lifeless attempt at capitalizing on past successes resulting in a film which is more likely to put audiences to sleep than scare them. This is a blatant attempt at selling a “franchise” rather than an actual film. What’s sad is The Nun will likely be the #1 movie in America this weekend, but that doesn’t change how Hardy’s film is the embodiment of failure.